This PRM-9000 Radiation Monitor is identical in most respects to its forerunner PRM-8000, i.e. 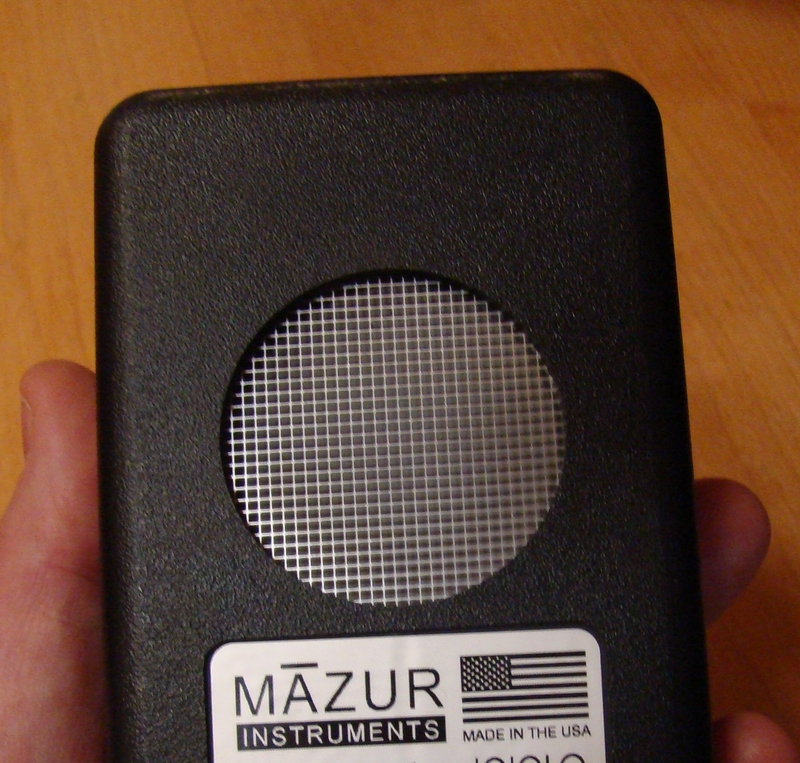 a Digital Pocket Geiger Counter designed to detect Alpha, Beta, Gamma, and X-Radiation, displaying through a digital readout, and emitting an audible click with each radiation count detected. But the major difference is that the PRM-9000 has been fitted with a large, pancake-style Geiger-Mueller tube. This is the same ultra-sensitive detector as used in the Inspector line of instruments. The photo (at right) of the back of the instrument shows the thin mica end window of the GM tube through the protective mesh screen, with a diameter of 45 mm (1.75 in), producing increased efficiency of radioactivity detection, and offering excellent sensitivity to low levels of Alpha radiation, in addition to normal Beta, Gamma and X-ray detection. This feature makes the PRM-9000 suitable for applications requiring higher levels of sensitivity such as checking food for radioactive contamination, subject to certain qualifications - click on the above link. The PRM-9000 is a very high quality, professionally engineered radiation detector Made in the USA. 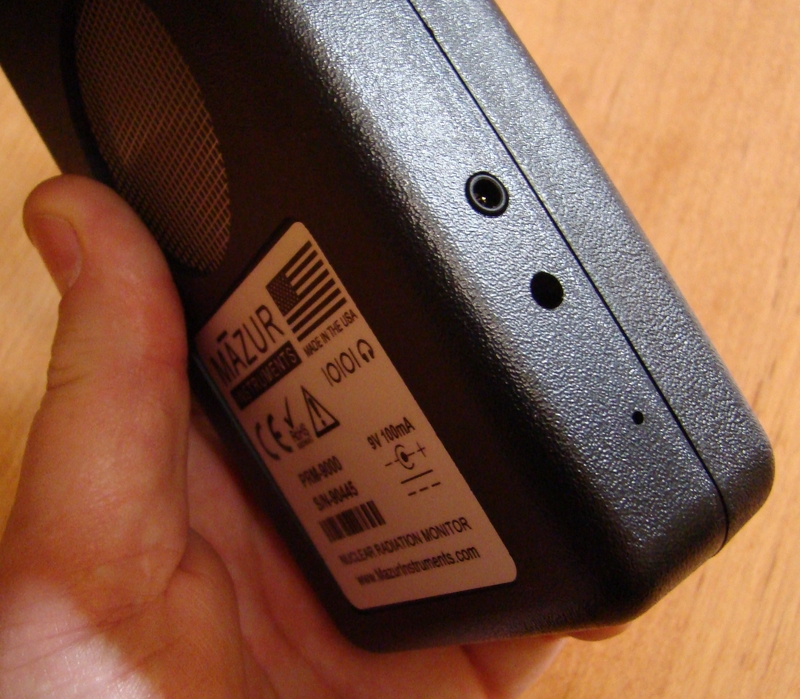 As a Geiger Counter, instead of a dosimeter, it is capable of providing immediate warning of radiation danger. The PRM-9000 is designed to be "Always On" at the user's option, and in that state, continuously monitors Current, Average, Maximum and Minimum Radiation Levels. This powered mode is made possible by an ultra-efficient hardware and software design that gives an incredible 3 year battery life, yet from a standard 9V alkaline battery. The PRM-9000 also includes an automatic Timed Measurement or Timed Count feature that is necessary to reveal low level contamination that a momentary scan might otherwise miss. Two ports are built into the PRM-9000, as shown in the photo at left. The bottom port accommodates an optional A/C Adapter for those who do not want to run on battery power. The upper port is multi-functional, serving as an Audio jack for earphones, and also as a Data Port which, when connected to an optional Data Cable, enables uploading of previously logged data. Finally, the data port can be configured for Pulse Output which, in conjunction with optional software, then graphs and records the radiation counts in real time. Given the need to check radiation levels from the Fukushima plant, the PRM-9000 display can be converted from English to Japanese language characters (see example at left). Two-line, alpha-numeric display with backlight to support low-light conditions. The device's unique Radiation Monitoring Engine (RME) is always-on collecting measurements enabling rapid environment assessment. The PRM-9000 instrument not only records the maximum radiation measured, but also displays the time and date at which the maximum occurred. With over 100K bytes of data logging memory included, the PRM-9000 can autonomously store up to 91,466 minutes or hours of time-stamped measurements. These measurements can then be uploaded to a PC in industry standard CSV format for analysis. Optional USB cable available. Designed by Mazur Instruments and manufactured in the USA, the PRM-9000 includes abundant I/O options including support for headphones, external speakers, external power and USB data exchange. Instruction manual in printed booklet form included. 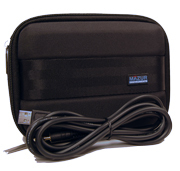 The price includes the Carrying Case shown at right (cable optional).